On a team full of stars it’s sometimes easy to overlook the value of other players, like Johan Franzen of the Detroit Red Wings. “The Mule”, as he was nicknamed by Steve Yzerman during his rookie season, is a large hockey player (6’3”, 223 lbs.) but in Hockeytown he has played alongside some of the largest legends in the history of the game: Yzerman, Chelios, Lidstrom, Shanahan, Datsyuk, Zetterberg. That could be why when you think of the Red Wings you don’t necessarily think of him right away, but he has had a solid career as the soon-to-be 34-year-old plays in his 9th NHL season. Since making his NHL debut in 2005, Franzen has scored 328 points (173g-155a) in 540 games, all obviously with Detroit. One of the highlights of his career was a four-goal game in the playoffs against the San Jose Sharks in the middle of what was an insane three-year stretch for the Swede in the playoffs. He tallied 18, 23, and 18 points in three consecutive postseasons between 2007-2010 and in 102 career playoff games the Mule has 79 points (42g-37a). After a recent trip to New Jersey, the Hockey Writers sat down with Johan Franzen to talk about the Wings upcoming outdoor game and Detroit’s new division rivals among other topics. The Hockey Writers: Was this a big character win for your team tonight on the road, in New Jersey, with the particular players out of the lineup? Johan Franzen: Yeah, it was big for us to see that we can win without Pavel Datsyuk & Henrik Zetterberg — just stick with the plan and stay patient out there. 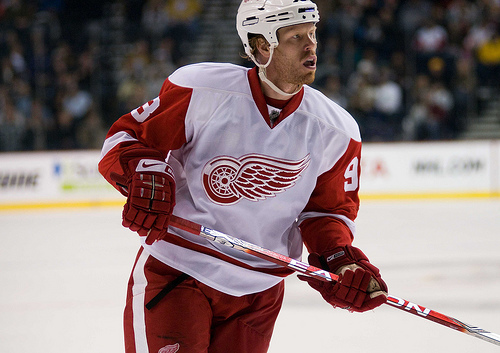 Johan Franzen helped keep the Wings afloat while Datsyuk & Zetterberg were out with injuries. THW: With those two players out of the lineup, you are relied upon more now in regards to minutes played and offense; what’s that like for you? JF: It’s fun, I just wish I had better legs in the two games we’ve played without them (laughs) somehow I have to find a way to get better. It’s a great opportunity for me, playing at center you really have to legs going. If you don’t have them you have to grind it out and you usually get rewarded if you just stick with it. I was fortunate today. THW: How has the team stayed positive through some rough stretches — which are kind of uncharacteristic of your franchise over the past two decades? JF: Actually we went through that a little bit last year, we couldn’t really find our game and we didn’t start playing well until the end of the season; and we started believing in ourselves. I think you just have to have that one game that makes you feel good about yourself and show everyone in here that we can do it. Everyone’s a good player, we just have to be positive about it and it makes you more confident in what you’re doing out there. It helps, a lot. THW: You’ve played in an outdoor game before (against the Chicago Blackhawks in 2009), how excited are you to play at Michigan Stadium against the Toronto Maple Leafs on January 1? Two Original Six teams will renew their rivalry outdoors at The Big House aka Michigan Stadium on January 1. JF: It’s going to be fun; it’s going to be great. Playing on home ice, but I don’t know, (laughs) Toronto will bring a lot of people, have a lot of fans there. It’s going to be really cool. I’m going to have a ton of family and friends there; I spent half of my paycheck on tickets already (laughs again) — it’s going to be fun. I try to stay cool and not get over excited about it, but you just have to remember it’s a two-point game and not make it too hard on yourself. THW: How much easier is it now for your team being in the East in terms of traveling? JF: You usually notice travel more in the playoffs, but you notice it. Instead of being home at three or four in the morning, now we’re usually home by one or 12:30. It’s good; we usually get a day off too after a road game. But we’ll really be able to tell after a full regular season the real difference; it wears you down slowly all that traveling. Usually you feel it the most when it comes to playoff time when you have to go back and forth all the time playing in Anaheim and cities like that. It’s takes a toll on your body for sure. THW: What do you think of the division you guys are now in, with teams like Montreal, Toronto and Boston to contend with? JF: Playing in Canada is always fun, all the fans that are in Canada are always really loud at the games. And Boston too; they’ve been a powerhouse for a long time now and they’re a good measuring stick (for us). That’s a team that you really have to go in and battle with and that’s a good rivalry for us. It’s great seeing/playing new teams, we’ve been playing the same teams for years and you know every guy on those teams. I wouldn’t say it gets old, but some nights you may lose focus a little bit. Here you have to stay on your toes and really know your opponent; you don’t even know all the players you are playing against. You really have to read scouting and all of that. It’s been fun. JF: Yeah (grins) not bad, not bad at all.